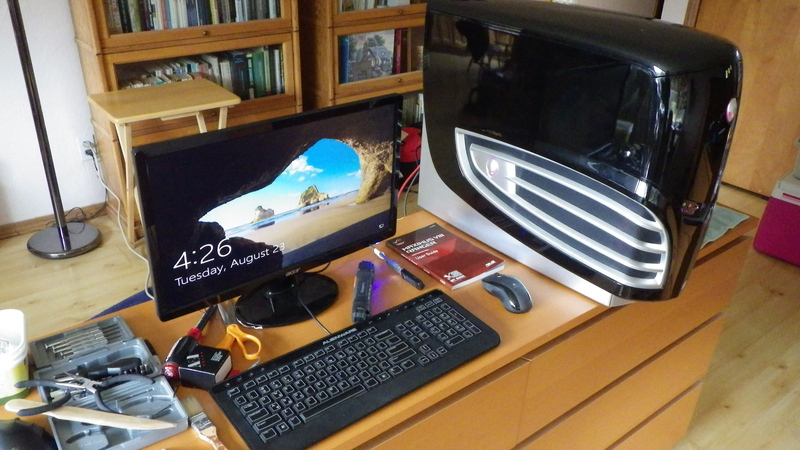 The refit of the Alienware Area 51 – 7500 from 2007 to a Skylake Processor and Windows 10 is complete. The system died trying to do the Windows 10 Anniversary Update, and while I spent two days frantically trying to bring it back to life with Linux Mint 18, I finally declared it End of Life and ordered the replacement parts. Here is the original configuration. Western Digital 1TB HD – Temporary. Once system is installed, the two HD from my current main system will be swapped in. These are a 2TB data and 4TB video capture disk. The ICYDOCK is a converter that allows easy mounting of SSDs into standard 3.5″ HD slots. I have used the plastic versions for many of my systems that don’t have dedicated SSD mounting points. But this new stainless model is very nice. It was on sale at NewEgg for $15. All the more powerful systems use water cooling. This system uses an Corsair H75 cooler. From the pictures, it is apparent that there is plenty of room for the cooler. The system is starting out with an older GTX 570 graphics card, but I’ll swap in the GTX 1060 card when the system is complete and all the games are installed. Since this is the most powerful system it will become my main computer. The new motherboard has several USB-3 ports, but only 1 USB-2 port. The light panel daisy chains the Photo card reader, but the system requires an additional port for the front panel USB ports. One downside of refitting an old case is that the standards have changed in the last almost 10 years. There is no reasonable way to refit the front panel ports to USB-3, but all new cases come with only USB-3 ports. Using this device, which is basically a USB-2 hub, the front panel ports will work again. For about $20 this will allow the front panel USB-2 ports to work.